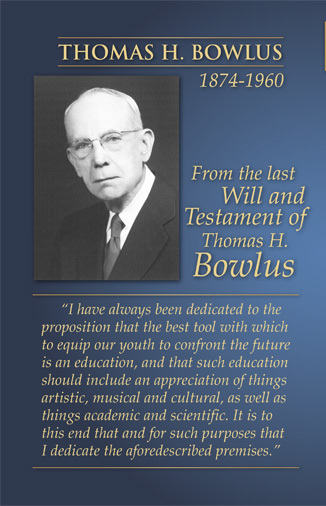 During his final illness in 1960, Iola citizen and banker Thomas H. Bowlus wrote a will directing that his estate be used to build and equip a fine arts center. The mission of the center is defined in the will as "to broaden the cultural background of area youth and make available to the citizens of the area facilities, programs and entertainments not otherwise available." The Center opened its doors in the fall of 1964, with Kansas City Mayor, H. Roe Bartle as the featured speaker at the grand opening and dedication. A few weeks later the Kansas City Philharmonic performed the first major concert in the new auditorium. Since its opening, the Bowlus Center has become an organization of regional significance and a sought after venue for touring artists. The Bowlus Center is a Testamentary Charitable Trust for the benefit of the students of USD 257 and the citizens of the area. A unique feature of Mr. Bowlus' will provides that the members of the USD Board of Education are designated as the Bowlus Board of Trustees, thus giving them the responsibility for maintaining and operating the Center for all the beneficiaries of the trust. The Bowlus houses classrooms for music, drama and art where USD teachers provide daily instruction to several hundred high school students. In addition to the 700+ seat auditorium the building also boasts the 120 seat Creitz Recital Hall, the Mary L. Martin Gallery, several practice rooms, dressing rooms and faculty and staff offices. During the years since 1964, thousands of people have performed at the Bowlus Center. Entertainers of all kinds, from the world famous to the kids next door, have presented their talents for area audiences. Among the artists who have performed on the Center's stage are such luminaries as Count Basie, Robert Merrill, Henry Mancini, Hal Holbrook, Minnie Pearl, Marcel Marceau, Lionel Hampton, Steve Allen, and a host of others. Funds for the operation of the Center come from a variety of sources. In addition to income from the investment of trust funds, monies are received from USD 257 for their use of the Center. Further income is derived from ticket sales, auditorium rental, grants and donations from government sources and corporate and private donors. Three private trusts make major contributions to the arts-in-education projects and the professional touring series each year. Furthermore, the Friends of the Bowlus, an independent community organization, solicits funds to assist with capital improvements and establish a permanent endowment. In his will, Mr. Bowlus expressed the hope that the fine arts center would be a facility of which the citizens and, most particularly, the youth could be proud. He might be pleased to know that his visionary gift continues to bring cultural enrichment and fun to new generations of area youth and a multitude of citizens who never knew him.